For those that care about day-to-day values of their portfolio, August was not a great month. Overall, I finished down about $9-10,000 compared to the end of July. However, I’m just staying the course and trying to buy more, if I can. Unfortunately, high expenses in Chicago limit my investments a bit so I haven’t been able to take advantage of the cheap stocks as much as I would like. 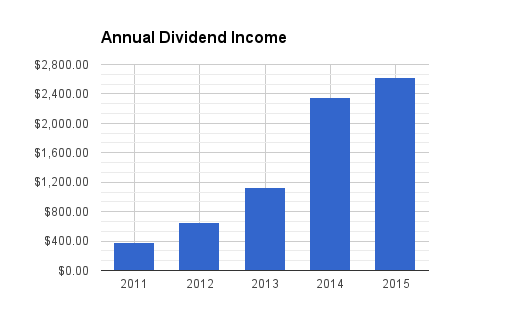 In total, I received $414.84 in dividends for August 2015. Last August I received $233.74, giving me an increase of 77% YOY! It will be absolutely amazing to be able to continue these kind of increases each year, but I highly doubt I’ll be able to sustain that. Of note, I’ve received $2632.33 so far in 2015. This is $300 more than I received in all of 2014. Options: I have also started selling some options again. These have all been on Apple for now, but I will be expanding that soon. I have one covered call on AAPL that I closed for a profit of $65.97. I then opened another covered call option on AAPL that I will be likely closing shortly. Keep focusing on those dividends and the overall value of your investments will come back. I also had a negative drop in net worth (largest drop) for August but had my highest dividend income month (ironic). Your stock selections should hold up very well for the long term. Thanks, DD! Just wish I had more cash to buy more shares when you’re cheap right now. Thanks for visiting and nice job yourself on the August dividends! Great update and nice year over year growth. Looks like we have only one name in common for the month which is cool. That’s the beauty of seeing different dividend investing portfolios. Thanks, DivHut. It looks like CAT might be the one we share. I really liked your latest September purchase of CAT and am hoping to free up some more capital to lower my cost basis in that as well. Take care! Very nice incomes there, the value doesn’t matter at all, the cash flow that what it matters. Thanks! I definitely agree. If the cash flows are there, the values will ultimately reflect that. Right now I’m glad for the high volatility since it makes it easier to find value. Thanks for visiting. I’ll be sure to check out your site when I get home from work.